At its peak in the 1940s and 1950s, polio was killing or paralyzing more than a half-million people worldwide each year, especially children and young adults. The “lucky” survived to walk on crutches. Others were so paralyzed they could no longer breathe on their own. Iron lungs, the mechanical ventilators that sustained them, symbolized polio’s reign of terror. In 1947, the University of Pittsburgh recruited Jonas Salk—an expert in influenza whose flu vaccine is still in use today—to develop a virus program at Pitt. For more than seven years, his team worked tirelessly to develop an effective killed-virus vaccine. In addition to his pioneering research with vaccines, Salk also studied and wrote about humanity’s role in the evolutionary scheme. In the same year that Salk began work on a polio vaccine, the new University of Pittsburgh Graduate School of Public Health was established in response to the needs of industrial Pittsburgh. The first class of thirty-four students matriculated in 1950, studying in temporary quarters in a wing of the Pittsburgh Municipal Hospital—the same building as Salk’s laboratory. Once Salk's vaccine was shown to be protective against polio and cases in the U.S.A. plummeted, iron lungs became historical relics. Just inside the doors from Fifth Avenue, our iron lung is a generous gift from the Salk Institute for Biological Studies. Located in La Jolla, California, and widely considered one of the top biological research centers in the world, the institute was founded in 1960 by Jonas Salk. 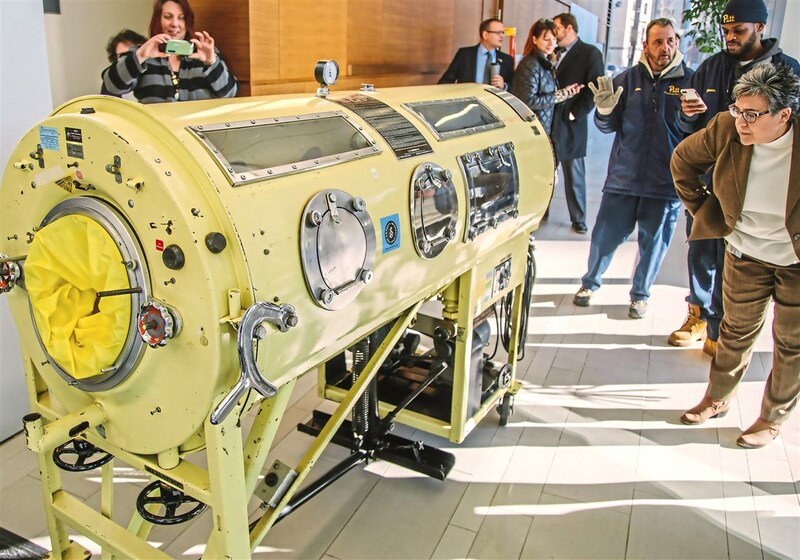 The iron lung stands as a symbol of the countless lives saved by public health initiatives like vaccination programs. And vaccines are just the beginning. Things like motor vehicle safety laws, tobacco use restrictions, family planning resources, and clean air and water standards keep people alive. Our students, alumni, and faculty are part of these life-saving initiatives each day. Pitt Public Health periodically hosts a symposium in Jonas Salk’s honor. Topics are chosen from among his varied interests based on continuing importance to public health today.